A river city of politics and commerce, Sacramento is in many ways spiritually closer to Chicago than it is to San Francisco or Los Angeles. The feel here is more friendly Midwest than free-spirited California. Still, this fast-growing city of 490,000 (with a metro regional population of 2.6 million) is plenty of sophisticated, surprisingly gay-friendly, and quite scenic. Sacramento is an ideal hub from which to explore northern California. It's within a two-hour drive of Lake Tahoe, Yosemite, the Gold Country, the Wine Country, the Russian River, and San Francisco. Sacramento enjoys moderate, generally pleasant year-round weather, although summers can produce hot but dry weather, and winter sees its share of rainshowers—it's a climate not unlike the Mediterranean. Average high-low temps are 55F/41F in Jan., 74F/50F in Apr., 94F/61F in July, and 79F/54F in Oct. Precipitation averages 3 to 4 inches/mo. in winter, an inch or less from spring through early fall, and 2 to 3 inches in late fall. Sacramento was established in 1839 in a fertile agrarian valley (elevation 17 feet), at the confluence of two rushing rivers, the American and the Sacramento. It's at the base the region made famous during the mid-19th-century Gold Rush, which commenced just 30 miles east, in the foothills of the Sierra Nevada Mountains. This city about 90 miles northeast of San Francisco was named California state capital in 1854. The terrain in Sacramento is mostly flat and the surrounding region, although becoming somewhat enveloped by fast-growing suburbs, is verdant and green. Compact, modern, and clean Sacramento International Airport is just a 15-minute drive or taxi ride northwest of downtown and is served by most major domestic airlines, with frequent nonstop service to most West Coast cities as well as Atlanta, Charlotte, Chicago, Dallas, Denver, Guadalajara, Honolulu, Houston, Minneapolis, New York City, Philadelphia, Washington, D.C., and others. It can be relatively inexpensive to fly here thanks to service provided by such value-driven carriers as JetBlue and Southwest Airlines. The city's greatest tourist draw is the kitschy but festive Old Sacramento, a Gold Rush-period 28-acre state park on the Sacramento River with museums (including the California State Railroad Museum), shops, and restaurants. 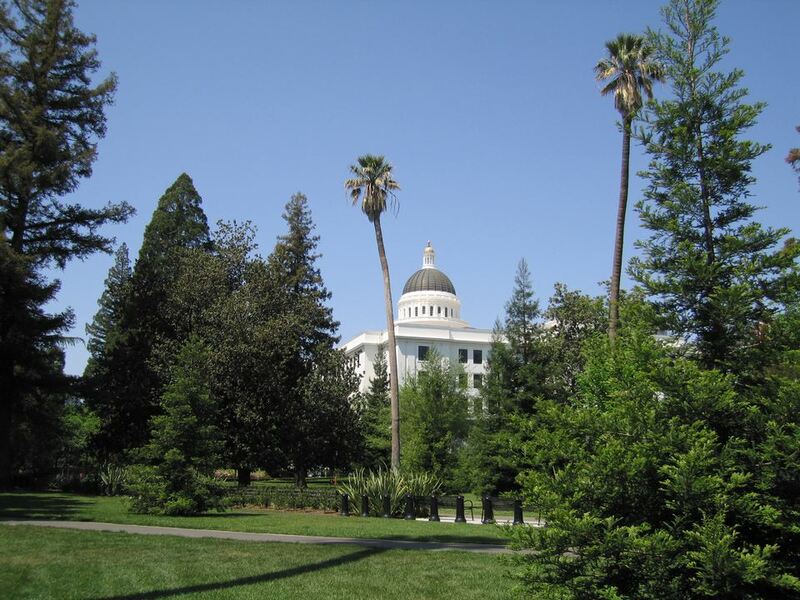 Top cultural attractions include the California State Capitol and Museum, an imposing 1874 building surrounded by a beautiful park; the fascinating California Museum, which provides a rich overview of state history; the acclaimed Crocker Art Museum; and Sutter's Fort State Historic Park, the restored adobe structure in which city founder John Sutter set up his trading post. You can better plan your gay Sacramento explorations by consulting some of the following links, among them the mainstream but very progressive Sacramento News & Reviews. You can obtain tourism information from the Sacramento Convention & Visitors Bureau, which has its own section devoted to GLBT travel, and local info on gay Sacramento resources from the Sacramento Gay & Lesbian LAMBDA Community Center, and also Out Sacramento. California's capital city has a great deal going for it, but it's also appealing because of what it's near - within a 1.5- to 3-hour drive you can reach dozens a major gay meccas and enticing vacation getaways, including San Francisco, the Russian River, the Napa and Sonoma Wine Country, Lake Tahoe, the Gold Country, and Yosemite National Park. The city itself, however, should not be overlooked, especially given the size and visibility of its gay community, which you may hear about a lot less than San Francisco's or LA's, but that actually ranks among the most organized and enthusiastic in the western United States. Visitors to the city will discover a lively and walkable downtown, packed with cool shops, restaurants, hotels, and such - many of them are along pedestrian-only K Street. In Sacramento's downtown, you'll also find the stately capitol building and marvelous surrounding gardens, and the historic Old Sacramento district along the Sacramento River. Midtown, which is due east of Downtown, has few attractions but is an ideal neighborhood for shopping, dining, and admiring numerous examples of Victorian, Craftsman, Arts and Crafts, Spanish Revival, and Colonial Revival architecture. The section of Midtown between 20th and 29th streets and E and N streets is known to many as Lavender Heights, owing to its high number of gay-owned homes and businesses. Sacramento has a handful of gay bars, enough to keep fans of club-hopping happy for a few days. Many of these places are in Lavender Heights, close to gay-friendly coffeehouses and restaurants. Some notable gay Sacramento nightlife options include Badlands, ​Faces, the Depot video bar,​ and the Bolt (for fans of leather). Among the many great restaurants in the city, some favorites in the GLBT community include Ernesto's (great Mexican food), Paesanos (gourmet pizzas and Italian fare), and Lucca (superb and inventive contemporary fare)—and that's just naming a handful. The city also has some excellent GLBT-friendly accommodations, the most distinguished being the luxurious Inn at Parkside.